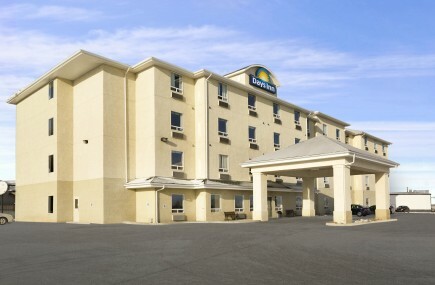 Days Inn - Moose Jaw, SK - VJ Management Inc.
Count on value and great times at Days Inn - Moose Jaw hotel, ideally located off Trans-Canada Highway 1. Our Moose Jaw hotel near Tunnels of Moose Jaw offers a prime spot in southern Saskatchewan, just minutes from shopping, restaurants, golf courses and local attractions. Whether you want to slide down the waterslide into our heated indoor pool, awaken your senses in our hot tub or workout in our fitness center, our pet-friendly Moose Jaw hotel offers all the amenities to make your stay exceptional. Get a sunny start with free Daybreak breakfast and use your in-room refrigerator to keep your favorite beverages and snacks fresh. Access free Wi-Fi Internet from your room or use our business center. We offer guest laundry facilities and meeting space for your convenience. Jacuzzi suites as well as non-smoking and handicapped-accessible rooms are available.